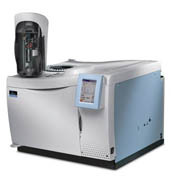 Gas chromatography (GC) is mainly used for the qualitative analysis of samples: it answers the question “What chemicals are present in this sample, and in what relative proportions?” The basic idea with GC is that you inject a liquid into a long coil (or column) which is contained in an oven. Because oven heats the coil the liquid will vaporize. Because the coil is long it will take the vapors some time to reach the end of the coil. Different vapors will exit the coil at different times. We can compare these times to standard values to determine the identity of the vapors, and therefore, the chemicals that were in the sample. Every form of chromatography uses both a mobile phase and a stationary phase. In GC the mobile phase is an inert (non-reactive) gas such as nitrogen or helium. The stationary phase is a non-volatile liquid that coats the inside of the column. An example is polyethylene glycol (PEG). Let’s say you want to run a GC on a sample which is two-parts ethanol and one-part 1-propanol by volume. You would inject a very small amount of the sample into the column- about 1 micro liter (uL; 1/1000 of a mL). The boiling point of ethanol is 80 ºC and the boiling point of 1-propanol is 97 ºC, so a good temperature for the oven is 88 ºC- the average of their boiling points. After injection the liquid would evaporate and the vapors would dissolve in the liquid coating the column (the stationary phase). The carrier gas (mobile phase) would push these vapors through the length of the column, at which point they would register with a detector. The time is takes to travel through a column is called the retention time (Rt). In general, the higher the boiling point of a liquid, the higher its retention time. So we would expect the ethanol to “come off the column” the first and then the 1-propanol; the ethanol would have a shorter retention time than the 1-propanol. This would be recorded as a two peaks. The area of each peak is proportional to the amount of chemical present in the sample. Because we have twice as much ethanol as 1-propanol, the integration of the ethanol peak should be twice that of the 1-propanol peak. The term resolution refers to well separated two peaks are from each other. 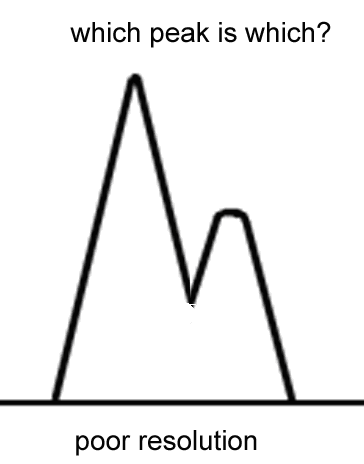 If two peaks are so close together that you can’t tell when one peak begins and the other ends the resolution is poor; you can also say that the separation is poor. If you can clearly identify two different peaks the resolution is good. The longer and more narrow the column, the better the resolution. Increasing the carrier gas flow rate and/or the temperature will send the vapors through the column faster, which will lower the retention time and worsen the resolution. Lowering the temperature and/or flow rate increases retention times and broadens the peaks. It’s important that the chemicals you wish to analyze are soluble in the mobile phase of your column. Otherwise, you won’t get a good separation. Remember the rule “like dissolves like”. For example, if you want to run a GC on octane, which is non-polar, silicone oil is a suitable mobile phase because it is also non-polar. 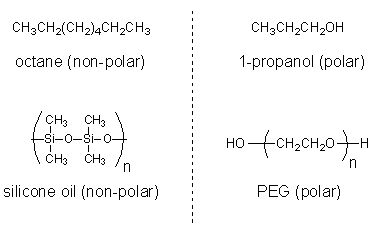 But for a polar chemical such as an alcohol, a polar mobile phase such as polyethylene glycol (PEG) should be used instead. Right after the injection your TA will probably run a small amount of air through the column. This marks a retention time of zero on the GC print out. To attenuate is to weaken. If the amplitude (height) of the peaks on your GC print out are too high your TA will increase the attenuation settings of the GC, which will lower the peak amplitude and the sensitivity of the detector. Conversely, if the sensitivity of the GC is so low that nothing registers with the detector, the right move is to decrease the attenuation settings. What do peak integrations really tell us? You should probably know how the chemicals are registered at two common types of detectors. A thermal conductivity detector (TCD) uses a material that changes its electrical resistance with varying temperatures. Helium is very good at transferring heat. Most other gases are not. So when a sample comes off the column, the temperature at the detector will suddenly drop. This causes a change in the electrical voltage, which registers with the detector. A flame ionization detector (FID) burns the sample as it comes off the column. This creates ions that produce an electrical current, which registers with the detector. An advantage of this method is that you don’t need to use helium gas, which is expensive. Nitrogen can be used instead. There’s not much of a procedure for this lab. You will stand with your TA as he or she runs GCs for several known alcohols. Then the TA will run a GC on an unknown sample, which is some combination of alcohols. Based on the retention time and peak integrations from the unknown sample GC you can determine what alcohols are present in the sample. For example, let’s say the retention times of methanol and 1-propanol are 3.04 and 5.42 minutes, respectively. If your unknown sample has two retention times of 2.96 and 5.51 minutes, then your unknown contains methanol and 1-propanol (the retention times won’t be exactly the same). The ratio of peak integrations tells you the relative amounts of methanol and 1-propanol by volume. It’s important to do all of your samples consecutively using the same GC. If you run a sample and then wait 30 minutes the air flow or temperature of the GC might have changed, which will alter your retention times. Q: A student runs a GC of the same sample on two different GCs. Will the results be the same? A: No. Factors such oven temperature, carrier gas flow rate, column length and diameter, and the type of mobile phase all influence retention times.